Pain Physicians NY (Brooklyn, Queens, Manhattan, Bronx NYC) is one of the first practices in New York to offer Platelet Rich Plasma (PRP) Injections for patients suffering with Plantar Fasciitis. Our facility equipped with the most advanced, cutting edge equipment to treat Plantar Fasciitis. Plantar fasciitis is a condition where the plantar fascia of the foot becomes damaged and swollen. The plantar fascia is a band of tissue, running from the bottom of the heel to the sole of the foot along the bottom of the foot where the bones of the toes originate. This ligament is very tough, but also flexible to act as a shock absorber for the entire body. Plantar fasciitis is the most common cause of heel pain. It is this ligament that creates the natural arch of the foot, which is essential for absorbing the weight of the body. On average, more than 50 tons of weight is absorbed by these ligaments while walking a single kilometer, so it is really strong. However, an increase of stress due to carrying heavy loads or staying on your feet for hours can cause these ligaments to become overexerted, thereby becoming irritated. This process begins gradually, starting with slight pain and soreness, but a further strain on the plantar fascia causes further damage which can become a serious condition. The ligaments become damaged and swollen with further strain. At this state of inflammation, the condition is referred to as plantar fasciitis. Certain types of exercises – runners, dance aerobics, ballet dancers, etc. Occupations that require standing for a long period of time during a day – teachers, factory workers, etc. Age – people between 40 and 60 years old tend to develop plantar fasciitis. Any of these causes lead to tears within the plantar fascia which eventually leads to plantar fasciitis. Pain on the foot and heel. This pain is exacerbated during walking and especially when climbing stairs. It is also most common after a period of rest, such as after sitting down or when waking from sleep. Once the foot limbers up during the day, the pain tends to go away or decrease. However, remember that the pain can return after sitting for a long period of time or standing up for a long period of time. The diagnosis is usually done through a physical examination and an analysis of the symptoms. Sometimes, further tests may be required if the doctor can’t establish a sure diagnosis, like MRI or X-ray just to eliminate other causes that can lead to heel pain. Management is done by resting the affected foot. The pain will usually go away after some time. To speed up the recovery, though, cold compression using ice and over-the-counter NSAIDs can help reduce the inflammation and eliminate the pain. Physical therapy plays an important role in the management of plantar fasciitis, as a Brooklyn physical therapist instructs you how to stretch the plantar fascia, strengthen the leg muscles as well as the Achilles tendons. Night splints are splints that will help you stretch the calf and the arch of the foot while sleeping. These splints will help stretch the plantar fascia. If conservative treatment is not helpful, steroid injections or extra – corporal shock wave therapy are recommended. If the condition was ignored for too long and worsened, surgery may be needed to repair the damaged tendons. 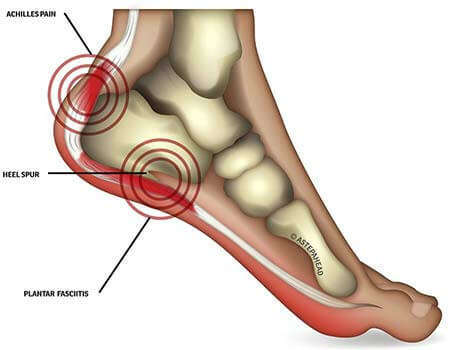 The most advanced pain management center, Brooklyn pain management doctors and specialists at Pain Physicians NY offer unique, individualized approach to manage your Plantar Fasciitis. We are using the most effective pain management options including Platelet Rich Plasma (PRP) and Corticosteroid Injections and utilizing the latest technologies available in USA.